Third in National Review senior editor Brookhiser’s series on the heroes of the American Revolution (Founding Father, 1996; Alexander Hamilton, American, 1999). 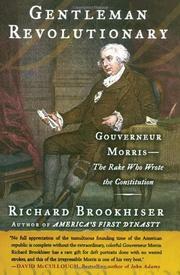 Gouverneur Morris was less celebrated in his own day than either Hamilton or Washington, but not for want of trying: he had an endlessly high regard for himself, chased women on two continents, led a life of wealth and influence before and after the Revolution (the seat of his family estate stretched from the Harlem River to Long Island Sound, and as a lawyer he commonly earned fees of $10,000 a pop), and was altogether satisfied with his abilities and accomplishments. The scion of French Huguenot and Dutch forebears, Morris enjoyed an aristocratic heritage that “represented something that existed nowhere else in the Thirteen Colonies [but New York]—an old world of European settlement that preceded the arrival of Englishmen.” For all that, Morris was quick to choose the Continental side when the war came, and unwavering in his devotion to the American cause. Although his leanings were fundamentally conservative, Morris championed religious freedom, disagreeing with fellow Federalist John Jay that “Americans were a united people . . . professing one religion”—which, Brookhiser points out, meant not Christianity but Protestantism—and holding vigorously that “matters of conscience and faith, whether political or religious, are as much out of the province, as they are beyond the ken of human legislatures.” Brookhiser also asserts, intriguingly, that Morris mistrusted democracy and favored national over states’ rights—and that he foresaw the Civil War as early as 1812, when he urged New York and New England to break away from the slaveholding states. As the lead author of the Constitution, Morris had ample opportunity to insert his views on such matters. Brookhiser might have done more to examine the text with an eye to that question, but this remains a balanced and thoroughly interesting study of the man and his time all the same.